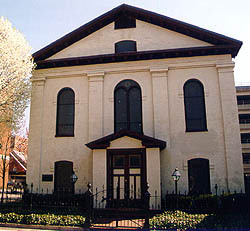 In 1865, following the use of two prior buildings, Cumberland's Jewish congregation purchased land at the corner of Union and Centre Streets for the erection of a synagogue. The B'er Chayim Temple was built in 1866 by prominent local contractor John B. Walton and reflects the history of Jewish worship in Cumberland. Cumberland's first documented mention of Jewish settlers occurred in 1816. By 1853, 12 families resided in the city, which then had a population of 6,150. A congregation was established in April of that year, and the Maryland legislature incorporated the B'er Chayim Congregation the following month. The first members of this congregation practiced orthodox customs and rituals, such as the separation of men and women at services. The orthodoxy of that congregation is reflected in the architectural simplicity of the original Temple, a two-story rectangular brick building with refined details such a pedimented gable, brick pilasters, and stained glass arched windows. In contrast, the decorative mouldings, double rows of brick arches, and mansard roof of the rabbi's house added to the Temple in 1900 reflect the more liberal attitudes of reform Judaism practiced by the congregation at that time. The American Reform Judaism movement was an attempt to modernize synagogue worship and a reevaluation of Jewish theology. Worship reform included choral singing, organ music, and the use of German instead of Hebrew for prayers and sermons. The B'er Chayim congregation's dissatisfaction with old forms and ceremonies resulted in many changes. Just a year after the Temple was completed, gender separation at services ended. By 1875, the practice of covering the head during services was discontinued. 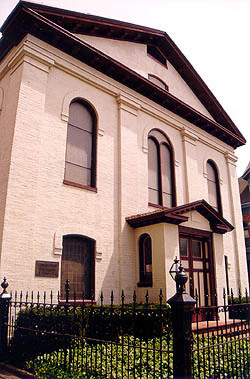 Today the Temple still serves as a place of worship for the B'er Chayim Congregation. The B'er Chayim Temple is located at the corner of South Centre and Union Sts. Religious services are held on Fridays at 7:30pm, tours are available by appointment. Please call 301-722-5688.